Stage3D acceleration is an already known feature and the new “toy” of several developers out there . 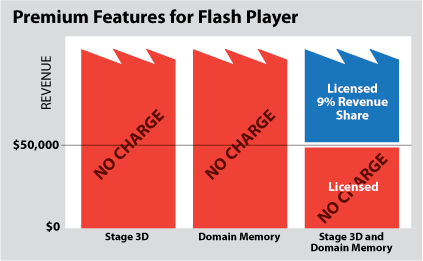 The domain memory, however, helps advanced compilers such as the upcoming new Adobe “Alchemy” compiler enable high-performance, sandboxed execution of cross-compiled C/C++ code in Flash Player. Using that you can blur the barrier between C/C++ and AS3 code, so you can create games using AS3 and existing C/C++ libs or easily port an already existing C/C++ game/engine into the Flash Player (such as Unreal Engine). It means if you use Stage3D alone or Domain Memory alone, there is nothing to pay. If you use both features together you must pay a 9% revenue share on per application net revenues above $50K. 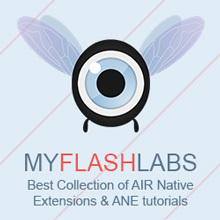 Also there is no revenue share required for use of these features within Flash content packaged as apps using AIR. Start your engines, developers, the time for breath-taking graphics and heavy weaponry has come to Flash! Via FlashDaily. See the official announcement here.